The Convention Center is said to be an economic driver that brings in outside visitors to Spokane, and this is the justification for continually expanding the facilities. In just a few years, the PFD will seek additional taxes to expand again. Does this economic driver work? Here is a comparison of airport usage versus convention center usage. Visually, there is no correlation; statistically, the R-squared value of the correlation is 1.6% (meaning zilch correlation). If the Convention Center brings in outside visitors, they do not arrive by air or the number is so insignificant as to have no impact. 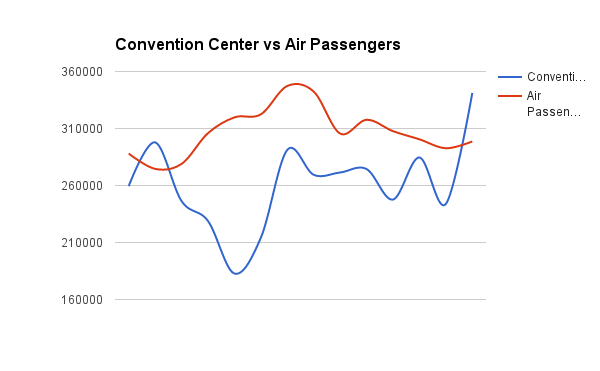 The air passenger data was scaled to a similar range to the Convention Center attendance for the purpose of comparison. In the chart above, the Y-axis shows convention center attendance; multiply by 10 for the air passenger number. There is no correlation with jobs, either. Outside of those two events, the remaining events average less than 700 people per day, the rest of the year. The Convention Center was just expanded so it can accommodate large events. Unfortunately, for a facility designed to accommodate up to 6,500 people, actual utilization is closer to 10% of best case, most of the year. For many months, the facility is almost unused. The INB Performing Arts Center is barely used for several months of the year. All charts come from the SpokanePFD.org web site and the 2014 end of year annual report produced by the Spokane PFD. Keep this in mind when in 2 or 3 more years, the Spokane PFD comes asking for more money for yet another expansion of their empty facilities.